At 24V, these fans are going to move a lot of air, but they’re going to be rather noisy as well. In a server room or industrial environment where cooling is all that really matters, this isn’t a concern at all. In fact, there isn’t hardly any 24V 140mm fans on the market to choose from. NOCTUA has a very intriguing option for those in need of this particular product. What really impressed me though, was just how well these fans worked in my own 12V tests. Airflow was favorable in comparison to other fans, but the radiator test on those 120mm industrialPPCs blew me away. Both fans pushed air through the fins with no effort at all and topped my charts as best radiator fans. This makes it very easy to choose between more performance or more silence. Which brings me to my final praise, and that’s the fact that all the fans were very silent. This is something that NOCTUA is known for, but the previous industrialPPCs were far from it. 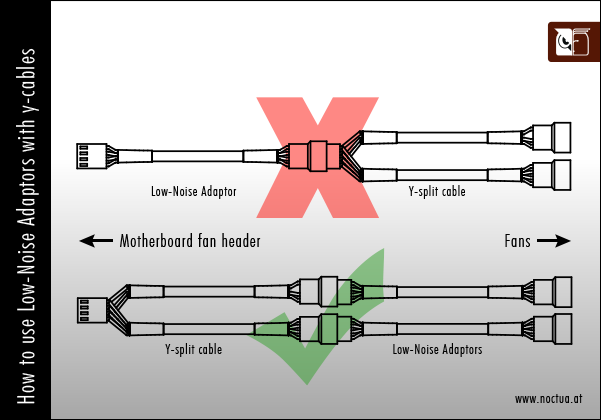 Overall, what impresses me the most is just how wide the range of application is for one fan. NOCTUA certainly did an excellent job. On my Megahalems testbed, the lower speed A14 iPPC was next to silent. Even the faster A14 iPPC was quiet. Even better, the Noctua NF-A14 iPPC-24V-3000 IP67 running at 12 volts seemed to hit a sweet spot between sound pressure level and cooling; after this, faster fans gave this system just a little bit more cooling at the cost of a lot more noise. Maybe all those little things Noctua have done on their frames do make a difference. Ottimi sono risultati nelle versioni testate i materiali, con telaio rinforzato in fibra di vetro, guaine a protezione dei cavi ben salde e decisamente ben realizzate; a queste si accosta una qualità costruttiva di primordine con profili palari allineati e privi di sbavature di stampaggio. Stonano unicamente le colorazioni degli antivibrazionali che risultano leggermente più scuri rispetto alle sorelle da 12v prodotte in fabbriche differenti. Sotto il piano prestazionale sorprende piacevolmente invece il basso punto di startup di soli 5v che permette di utilizzare queste iPPC anche in sistemi convenzionali fornendo una ventola sicuramente più parca e maggiormente regolabile rispetto alle versioni alimentate da una tensione di dodici volts. Il merito di questo va all'SSO2 modificato con tre fasi di alimentazione che permette un regime di funzionamento sicuramente più lineare a fronte di un consumo tutto sommato contenuto per una ventola rinforzata e protetta contro le infiltrazioni di acqua fino addirittura ad una immersione completa protratta per oltre 400 secondi a tensione nominale in acqua del rubinetto con sali e relativa conducibilità elettrica. Un risultato di tutto rispetto! Noctua profite de sa série IndustrialPPC-24V destinée aux applications industrielles, qui tournent généralement sous cette tension, pour palier au problème de volume sonore qui se posait avec sa gamme IndustrialPPC « classique ». Cette dernière est certes très efficace voire trop car pour de simple radiateur de ventirad ou d’AIO, nous n’avons pas besoin d’autant de souffle. Du coup, en alimentant cette nouvelle gamme en 12 V, nous réduisons quasiment de moitié la vitesse de rotation. Les valeurs recueillies sur le sonomètre et confirmer par notre oreille approuvent grandement cette décélération de la rotation des pales! Il est tout de même conseillé de ne pas descendre sous le minimum de tension requis (6 V), les tr/min chutant brusquement à ce niveau ce qui engendre une perte notable des performances de refroidissement. En 12 V nous retrouvons un niveau de performance identique à vitesse égale. 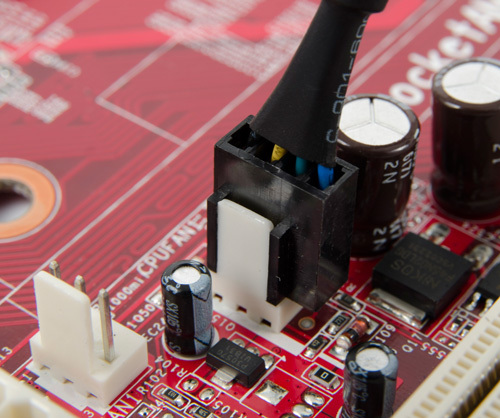 While the 24V models are primarily designed for industrial applications and requiring 24V to run at their full 2000 and 3000 high RPM ratings, they are not completely out of place inside a regular desktop system. 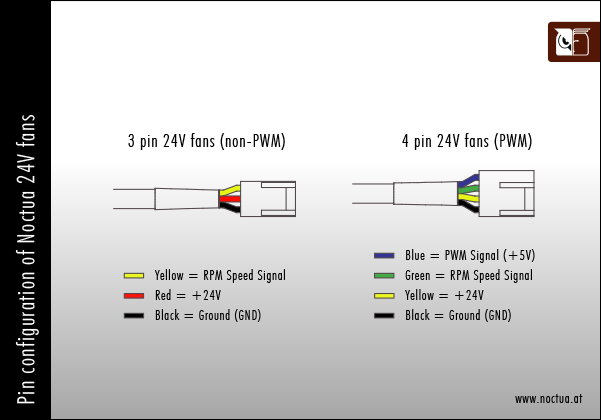 At 12V, they operate as low-noise versions of the regular Industrial PPC and with added IP67 ruggedization of course. This protection is somewhat of an overkill on a regular desktop but it does ensure that it will operate much longer than any other fan without, living up to its warranty life. [...] In terms of performance, the 24V Industrial PPC running at 12V show very good thermal management and reaching much lower noise levels than other fans. These low noise levels are more in-line with what is typically expected of Noctua rather than the usual powerful Industrial PPC line. The larger AF-14 in particular has very good sound signature that is even across all levels. Ở mức điện thế 12V Fan quay quanh mức 1000RMP theo ghi nhận của BIOS máy tính , nhưng lượng gió và hiệu năng giải nhiệt mà chúng tôi cảm nhận được là ngang ngửa với những Fan PC khác khi quay ở tốc độ hơn 2000RPM . Điều thú vị nhất là ở mức 12v thì Fan hầu như không phát ra tiếng ồn , đây sẽ là ưu điểm nổi bật với những ai khó tính về độ ồn. Przetestowane wentylatory z serii IndustrialPPC 24V to wentylatory z bardzo wysokiej półki. Świetnie schłodzą wnętrze obudowy czy maksymalnie rozgrzany radiator lub chłodnicę. Śmigła posiadają szereg ważnych cech takich jak odporność na kurz i wodę. Podsumowując jakość wykonania stoi na wysokim poziomie, są to zdecydowanie produkty z klasy Premium. Après les Industrial PPC "classiques" en 12V testés ici Noctua revient avec des modèles qui fonctionnent en 24V, pour les machines qui ont besoin de ventilateurs fonctionnant à cette tension, tous sont équipés de la certification IP67 garantissant un fonctionnement dans des conditions extrêmes. Malgré leur tension nominale de 24V ils fonctionnent très bien dans un PC de bureau capable de les alimenter en 12V, la seule conséquence est la baisse des RPM passant à 1050 RPM pour les modèles 2000 RPM et 1700 RPM pour les modèles 3000 RPM. Une fois dans un PC de bureau ils se transforment en excellents ventilateurs à tout faire, rivalisant sans le moindre problème avec leurs confrères, les 2000 RPM sont inaudible en 5V et très discret en 12V, les 3000 RPM sont très silencieux en 5V mais par contre se font clairement entendre en 12V, il y en a pour tous les goûts. Iz rezultata testova možemo zaključiti kako je najisplativija nabavka A14-2000 modela koji donosi najbolji omjer buke i performansi, naravno ako u kućištu ili na hladnjaku imate mjesta za njega. U suprotnom će F12-2000 morati biti dovoljan. F12-3000 je malo prebučan, baš kao A14-3000 koji ne donosi prednost u performansama nad A15. U 24 V režimu rada ih nismo mogli isprobati no vjerujemo kako su im performanse vrhunske i kako tjeraju velike količine zraka, jer su već i na 12 V moćni. Buka je naravno ovdje sporedan faktor, pogotovo kada rade u 24 V režimu, pa se na to nećemo ni osvrtati, no u PWM režimu i pri nižim opterećenjima svi oni mogu biti i vrlo tihi (do 1200 – 1300 okretaja). Éstos Industrial PPC son seguramente los más “todoterreno”, gracias a su protección IP67 y a que son capaces de funcionar tanto a 12 como a 24 voltios de tensión. Además, cuentan con todas las tecnologías que Noctua lleva años desarrollando, entregando un rendimiento máximo en todos los ámbitos y reduciendo al mínimo posible el ruido. Especialmente los modelos NF-F12 están indicados para todo tipo de máquinas, ya sean industriales o caseras, ya que presentan bajo nuestro punto de vista el mejor balance de rendimiento y ruido posible. 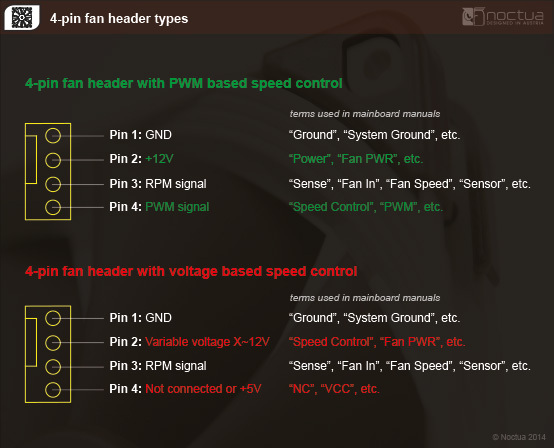 What pin configuration do Noctua 24V fans use?